The Soil Health Seminars programming at the 2018 Empire Farm Days at Rodman Lott and Son Farms in Seneca Falls, NY, will provide the opportunity to hear from soil specialists, learn from farming peers in daily panel presentations, see tabletop demonstrations, tour never cover crop plots, and have a soil report created for your use. The presentations are free and organized by the New York State Interagency Soil Health Working Group. The featured speaker at the Soil Health Center at 9:30 am on Tuesday, August 7, 2018, will be Sally A. Flis, Ph.D., director of agronomy at The Fertilizer Institute, Washington, DC. She will share an update on 4R research and discuss how to adjust fertilizer management for soil health-building practices such as no-till, reduced till, cover crops, legumes in rotation, and manure management, and how growing conditions in the Northeast effect 4R management. 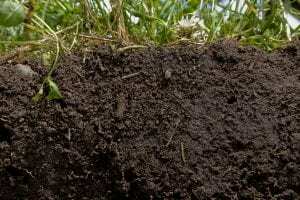 On Wednesday, August 8, at 9:30 am, Harold M. van Es, a 30-year professor of soil science at Cornell University will discuss why healthy soil is the foundation of sustainable crop production and how understanding interactions among the physical, biological, and chemical aspects of soil is key to good soil health management practices, including how to enhance soil organic matter. The audience will learn how reducing tillage and adding cover crops and organic amendments result in increasing the quality and quantity of organic matter to benefit soils and crops. The Thursday, August 9 speaker at 9:30 am at the Soil Health Center at Empire Farm Days will be Cornell University Cooperative Extension Field Crops Specialist Michael E. Hunter addressing “Weed Management for Cover Cropping and Conservation Tillage Systems.” Mike will cover the challenge of managing residual herbicides in soil health cropping systems that include cover crops, interseeding, diverse rotations, and no-till or strip tillage in the Northeast. Cover crop termination and herbicide resistance management strategies will also be discussed. Daily at 10:30 am, King’s Agriseeds and Seedway representatives will lead tours of the side-by-side field trials of new cover crop single species and mixes, including stress-tolerant summer annuals for no-till and conventional till systems; combinations for dealing with soil compaction and adding organic matter; pollinator- and butterfly-friendly mixes; crops for use after small grain or vegetables; and natural biofumigants. Thursday, August 9: Challenges of Managing Herbicides Within Systems That Incorporate Cover Crops, Reduced Tillage and Diverse Rotations. Empire Farm Days is the largest outdoor agricultural trade show in the Northeastern U.S. Show hours, daily schedules, directions and information about exhibitors, demonstrations, ride and drive opportunities, live animal programming and more are posted at www.empirefarmdays.com. Also see Facebook and Instagram. 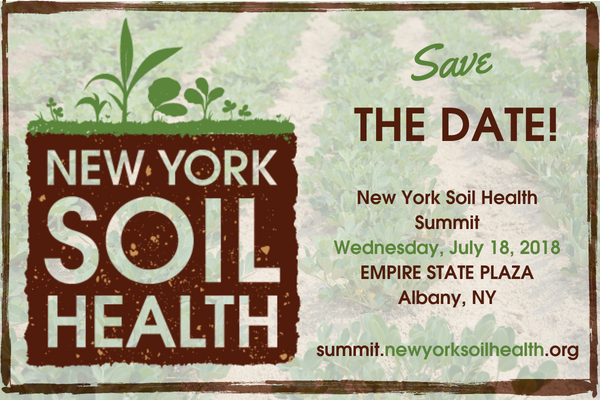 Save the date for the first New York Soil Health Summit. 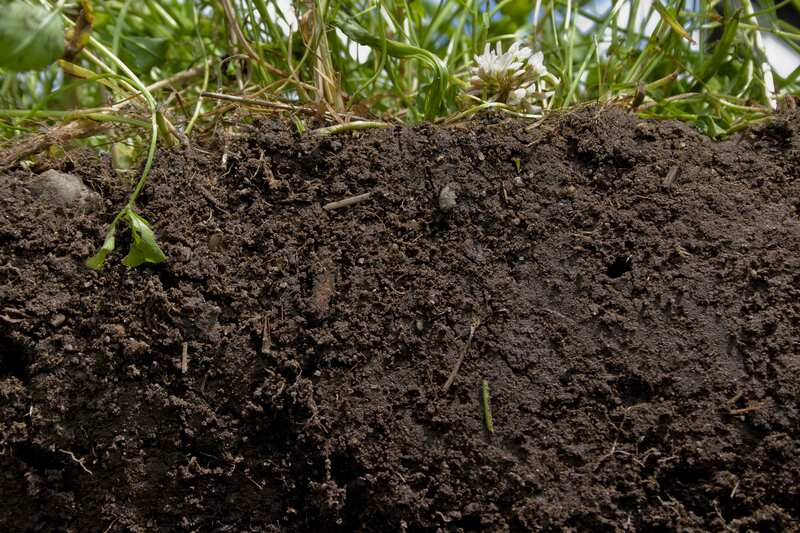 This event, organized by the New York Soil Health project, is for farmers, researchers, agriculture service providers, government agencies, non-profits and policy-makers interested in advancing soil health efforts across the state. Don’t miss this opportunity to connect with colleagues and contribute critical feedback to the NY Soil Health Roadmap. Registration, summit agenda, and other details will be coming soon. For more information at this time, contact David Wolfe (dww5@cornell.edu) or Aaron Ristow (ajr229@cornell.edu). New York Soil Health is funded through New York State Department of Agriculture & Markets. 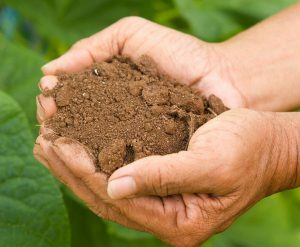 The New York State Working Group for Improved Soil Health has announced a full schedule of activities for the Soil Health Center at the August 8, 9 and 10 Empire Farm Days at Rodman Lott and Son Farms in Seneca Falls, NY. Activities include daily USDA Natural Resource Conservation Service presentations, farmer panel discussions, cover crop field plot tours, a Wednesday-only keynote presentation with conservation biologist and invertebrate ecologist Carmen Greenwood, lunch sponsored by King’s AgriSeeds, and daily raffles of soil health tests from the Cornell Soil Health Lab and Dairy One and cover crop seed from Seedway.
. 11:30 am: Fertilizer and Nutrient Management in Cover Crops and Reduced Tillage Systems Farmer Panel with Jim Hershey, Hershey Farms, Elizabethtown, PA; Steve Cuddeback, Cuddeback Farms, Skaneateles, NY; John Kemmeren, Angel Rose Dairy, Bainbridge, NY; and moderator Janice Degni, Cornell SCNY Dairy and Field Crops Team Leader. Pennsylvania No-Till Alliance President Jim Hershey has practiced no-till for more than 25 year and uses a five-way cover crop mix on his 600-acre livestock and grain farm in the Chesapeake Bay Watershed. In 2016, Steve Cuddeback, an advocate for high calcium lime application with minimal tillage techniques to increase yields over time, harvested record yields of no-till soybeans and zone-tilled corn grain on this 800-acre cash crop farm. John Kemmeren has practiced no-till for 40 years, no-tilling 750 acres of corn, hay and pasture at his 750-acre dairy farm.
. 11:30 am: Avoiding or Reducing Compaction Using Cover Crops, Reduced Tillage Systems and Other Management Strategies Farmer Panel with Janette Veazey-Post, Lamb Farms, Inc., Oakfield, NY; Joe Brightly, Brightly Farms, LLC, Hamlin, NY; Scott Potter, Dairy Support Services, Cortland, NY; Brad Macauley, Merrimac Farms Inc., Mount Morris, NY; and moderator Paul Salon, USDA NRCS Regional Soil Health Specialist. Janette Veazey-Post co-manages a 12,000-acre progressive dairy farm, growing mostly strip-tilled corn and alfalfa. WNY Soil Health Alliance board member Joe Brightly grows grains, fresh and processing vegetables, and apples using strip tillage, cover crops and cover crop mixes, plus an interseeder he built for 2017. Since 1994, Scott Potter has provided forage production and application services to CNY dairy farms: 120 million gallons of manure per year, planting 1700 acres of corn, and harvesting 8000 acres of corn and haylage. Brad Macauley uses minimum till, cover cropping and double cropping to feed dairy cows and grow vegetable crops. Dr. Carmen Greenwood will show how live soil-dwelling invertebrates, primarily soil mites, serve in vital ecosystem roles, provide conservation benefits, and act as indicators of soil health. Dr. Greenwood is an associate professor of entomology at SUNY Cobleskill and a member of the New York State Pollinator Task Force.
. 11:30 am: Utilizing Soil Health Practices in Vegetable Cropping Systems Farmer Panel with Josh Jurs, Kreher’s Farms, Clarence, NY; Dan Henry, W.D. Henry and Sons Farms, Eden, NY; Kurt Forman, Clearview Farms, Palmyra, NY; and moderator Darcy Telenko, Cornell Extension Vegetable Specialist. Kreher’s Farm Crop Manager Josh Jurs is currently updating his 3000 organic acre cover crop program to incorporate different species to target a balance of soil health and biology and sustainability. Dan Henry’s soil health practices at W.D. Henry and Sons’ 400-acre fresh market vegetable farm include planned crop rotations and cover crops. Kurt Forman of certified organic Clearview Farm builds his wide variety of soils using cover crops, composted manure, and crop rotation, helping to control weeds and insect pests, and reducing the cost of nitrogen fertilizer.
. the New York Soil Health Trailer. The Soil Health Center at Empire Farm Days is a cooperative effort of the New York State Soil Health Work Group comprised of USDA NRCS, conservation districts, state government agencies, educational institutions, the Cornell University Soil Health program, cooperative extension, non-governmental organizations, farmers, private consultants, and agribusinesses working towards developing innovative solutions to improve soil health and raising awareness of soil health concepts by producers and ag service providers. For more information, contact Paul Salon at 607-562-8404 x 103, paul.salon@ny.usda.gov. The Soil Health Center at Empire Farm Days was established in 2015 as a permanent site for soil health programming at the annual event that is the largest outdoor agricultural trade show in the northeastern U.S. Empire Farm Days show hours are Tuesday-Wednesday 9 am to 5 pm and Thursday 9 am to 4 pm. Parking is $10 per vehicle. Visit www.empirefarmdays.com or call 877-697-7837 for more details.